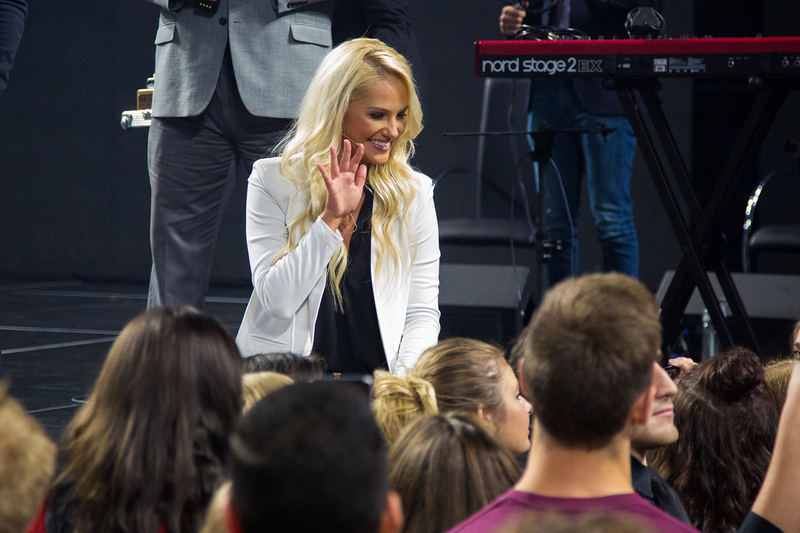 Television personality and political commentator Tomi Lahren talked about the importance of standing up for your beliefs and, more importantly, your faith as she addressed the crowd at Liberty University’s Convocation Monday morning. Lahren is best known for her “Final Thoughts” segment, which has more than 580 million views on social media. Currently, she is a host and contributor for Fox News and has appeared on “The Daily Show,” “Real Time with Bill Maher,” “The View,” and other popular talk programs. Senior Vice President for Spiritual Development David Nasser introduced Lahren, who was invited at the request of several students. Lahren thanked the university for hosting her, saying she was honored to be at Liberty. Though Lahren is known for her conservative stance, she started off by encouraging students to learn from others who have opposing viewpoints. 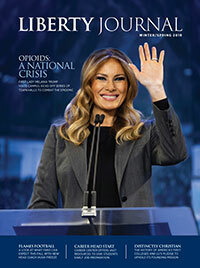 She asked students to raise their hands if they had ever been told they should never bring up their beliefs, faith, or politics at family events or in social discourse. After hands raised across the Vines Center, Lahren said whoever told them that, in her opinion, gave them bad advice. Lahren said she believes that a culture geared toward not talking about politics or religion has led to less of an understanding on those critical issues. “What we should be taught is to have a civil conversation about a difficult topic,” she said. Bringing her hard-hitting, fast-talking persona to the Liberty stage, Lahren presented her “Final Thoughts for Liberty University,” where she discussed her conservative opinions on topics such as gun control, free speech, immigration, respecting law enforcement, and media. Lahren said that everyone is entitled to voice their opinions under free speech, but that doesn’t mean people should stifle criticism when they do. In closing, Lahren took time to talk about her faith. Growing up, she said her parents taught her to love and revere God. She took a moment to recognize her father who was in the audience. She said that her faith has brought her through tough situations, and she encouraged students to also rely on their faith when facing life’s challenges. “Every single time I’ve wished for something, every single time I’ve prayed for something and it doesn’t happen, it’s because God had a better plan,” she said. Senior Hayden Robertson said he was glad Lahren talked about the importance of having conversations with people you don’t agree with. A journalism major, Robertson said he disagrees with some of Lahren’s viewpoints in the media and tries to listen to more than one network. Senior Zack Lazo said he was pleasantly surprised by Lahren’s speech. Lazo, who is studying digital media, said even though he does not want to be a political commentator, he learned from Lahren how important confidence can be for a media personality. In a press conference following Convocation, Lahren said she was excited to speak at Liberty because the university has a history of inviting speakers with differing viewpoints. She noted when Bernie Sanders spoke at Liberty in 2015.